Having completed most of the bookings for my main trip I decided to go on a little "Trial Run". As a birthday present for myself I decided to drive up to Scotland for a long weekend at the end of April. 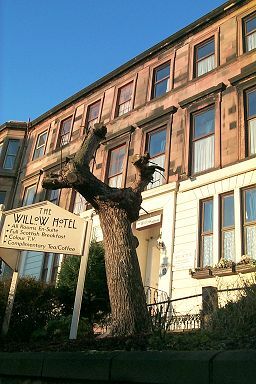 I decided to spend the first and last night in Glasgow and booked a room in the Willow Hotel (228 Renfrew Street, Glasgow; Tel. +44-141-332 2332), where I usually stay when I visit Glasgow. It is located only a few minutes from the Glasgow School of Art, about 10min walk from the town centre and may be 5min walk from the pubs in Sauchiehall Street. The remaining time I planned to spend in Argyll, possibly visiting the Crinan Canal. 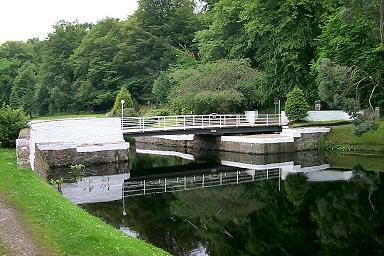 This nine-mile-long canal links Ardrishaig on Loch Fyne with Crinan on the Sound of Jura, cutting out the long journey around the Mull of Kintyre. Another idea was to visit the Isle of Gigha, a small island on the west coast of the Kintyre Peninsula. I was planning to stay in Rhu House near Tarbert, but as of writing this page this wasn't confirmed. Another alternative was to stay a night in Campbeltown, depending on what I was going to do ultimately. I was also going to try out if my plans of updating this site from the road would work out, testing my GPRS phone and bluetooth card. I had tested it successfully at home, now it was getting time to test it on the road.